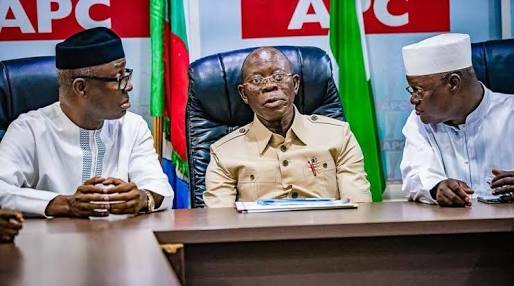 The post-primary crises rocking the ruling All Progressives Congress (APC) worsened on Thursday as more defections hit the party. States affected by latest defections are Ogun, Kogi, Kebbi and Imo. The defections occurred three days to the deadline given to political parties by the Independent National Electoral Commission for substitution of candidates. It was gathered that the party, which ended its governorship primaries on October 5, had been striving to solve some of the crises before the December 2 deadline for the substitution of governorship and houses of assembly candidates. The plan of the party, it was learnt, was to accommodate the interests of members, who were aggrieved by its primaries. But development on Thursday indicated that the efforts of the APC were not yielding fruits as more members defected. In the House of Representatives, the Speaker, Yakubu Dogara, read defection letters of three APC lawmakers, including Messrs Abdulkabir Akinlade (Ogun State), Mohammed Ajalah (Kogi State), and Salisu Koko (Kebbi State). Ajalah defected from the APC to the PDP, while Koko moved from the APC to the SDP. Akinlade, who is the governorship candidate of the APC faction in Ogun State led by Governor Ibikunle Amosun, defected from the APC to the Allied People’s Movement. The National Working Committee of the APC had affirmed Mr Dapo Abiodun, as the authentic governorship candidate of the APC in Ogun State, an action Amosun kicked against. Four members of the House of Representatives had last week dumped the APC for various parties. They included Mukaila Kazzim representing Abeokuta North/Obafemi-Owode/Odeda in Ogun State, who is believed to be loyal to Amosun. All the lawmakers blamed their defections on the APC’s handling of its primaries and selection of candidates for the 2019 general elections.